Next year, the last group of students born before the year 2000 will leave high school. Realising this, it comes as little surprise that many current students have no lived experience of making images using film cameras. Much less do they know what it’s like in a darkroom. The reality in schools is that darkrooms are disappearing, along with the camera equipment. Students today record the world using instantaneous technology. The notion that the final image is the result of a temporal process in which time and light interact can seem counter-intuitive, even irrelevant. For them, the photograph begins with the result. At a recent workshop, I spoke to a number of teachers who said that without access to the actual technologies, it can feel futile trying to teach students the history and theory of the photographic medium. Is it still important, or even possible, to learn this history in schools? And, if not, what are the alternatives? A recent contemporary photography exhibition at the Gallery provided an opportunity to unpack some of these ideas with students and to experiment with educational approaches within the Gallery spaces. New matter: recent forms of photography presented work by artists who are preoccupied with the material properties of the photograph. 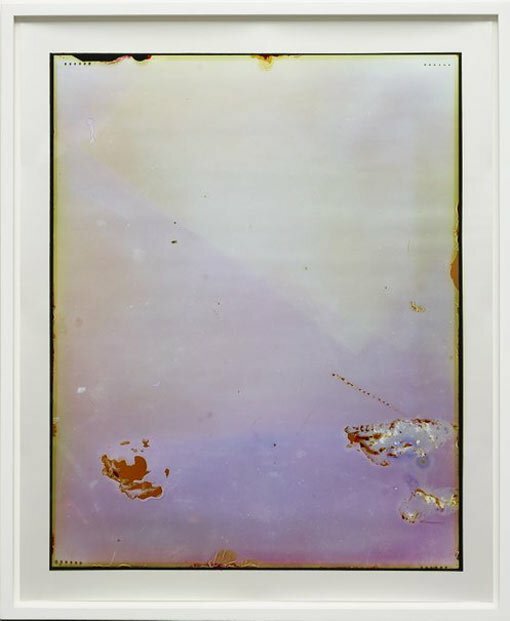 To create the images on display, many employed analog photographic methods but subverted their traditional use to emphasise the physical process of production. Rather than looking through a photograph at the pictorial content, in this exhibition we were guided to look at it. One of the exhibited artworks was Justine Varga’s 2011-12 cameraless photograph Desklamp , an atmospheric image of mottled pastel colours and mysterious blotches. I tried a few different approaches to Varga’s work with the students: the most successful was a strategy of extended looking. 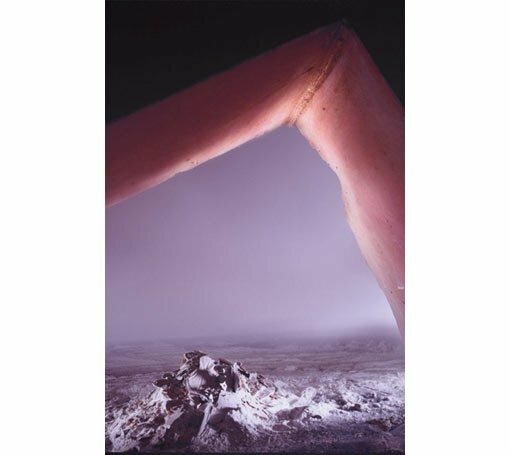 It involved slowing down the pace and establishing an arena for imaginative contemplation and embodiment before any discussion of Varga’s actual photographic process. Our discussion led the students to inhabit the ‘world’ presented by the image. We imagined being inside a mountainous landscape that was foggy and hazy, where there was a cool breeze and it had just started to rain. It was dreary in there but peaceful and calm. I aimed to maintain the student’s attention for 10-15 minutes. Only after this did we move on to discussing how the work was made and, after hearing their guesses, I revealed that the image was not a mountainscape but a series of chance chemical interactions resulting from Varga leaving the negative on her desklamp for a year. Groups of students who had been provided with all the material information at the start were less interested in the technical process of work than students who were left to wonder. As well as engaging the students’ imaginations, this extended-looking strategy had conceptual parallels with Varga’s extended process of exposure, perhaps helping them to empathise with the temporal in her practice. Another work in the exhibition, Jacqueline Ball’s 2013 photograph Fluctuate #6 feels similarly ethereal and other-wordly. However, with its horizon line and window-like framing device, it is less abstract than Desklamp . A couple of groups of high school students were very quick to pick up on the fact that what we were looking at was not a real place but a constructed set that has been photographed. They were also not surprised by Ball’s photographic trickery, and it occurred to me that perhaps they don’t expect photographs to tell us the truth as they themselves live in an increasingly mediated world where illusion, simulation and constructed realities are to be expected. I started wondering if and how artists working in the years before photography used illusion and artifice to draw attention to materiality. 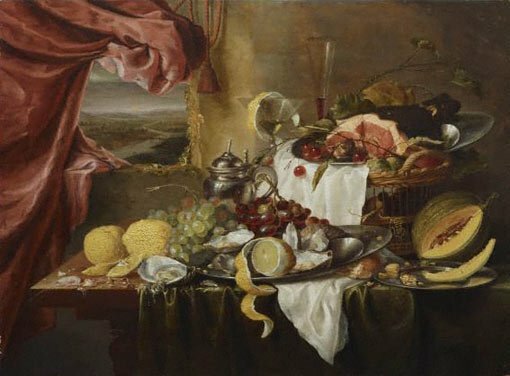 In the painting Still life with imaginary view c1645-c50, on display in the 15th- to 19th-century European galleries, Dutch Golden Age painter Laurens Craen inserts an ‘imaginary view’ of an overcast landscape into the background of his still-life composition, which features a decaying arrangement of decadent foods. Because of the title, we do a double take, through which Lorenz cleverly reminds us not to forget that his artwork is a constructed scenario of subjective material decisions. Subsequently, I took students to see this painting at either the beginning or end of our session in New matter and related it to Ball’s work. One of the ideas New matter asked viewers to engage with was the ‘how’ in photographic practice, and from an educational perspective this proved to be a complex, and interesting, proposition when working with younger audiences. Many artists in the exhibition foreground time and process in their works which was a point of difference to students’ usual sense of a photograph. By using alternative methods of engagement that sought to scaffold the ‘how’ with considerations of ‘what’ and ‘why’, the alienation or distantiation caused by this difference is exactly what allowed them to ‘focus their attention on what a photograph is, not simply what it depicts…’. These experiences with students highlighted the need for education practice to be responsive, collaborative and experimental in its approach if we are to engage this generation. They are, after all, experiencing photography in an unprecedentedly different way to older generations who lived through the transition from analog to digital. Previous post: Who's that artist in the window?